Are Content Mills Detrimental to “Real” Journalism? DMS and Yahoo-owned Associated Content are two of the biggest and most well-known content mills. As I mentioned in a previous post, I also have accounts on Break Studios and Suite 101, among others, but my primary means of income is DMS. I also recently signed up and was approved for Textbroker. But why would I write for a content mill when I’m pursuing a degree in journalism? And am I inadvertently contributing to the downfall of my own field? I write for these sites because of the reasons I gave above: easy and steady work, and reliable pay. It usually takes me no more than half an hour to write a technology article for DMS, and, if I’m feeling particularly productive I can write 10 or more in a day. Aside from the assurance that I will always have something to write about, writing for DMS helps boost my confidence as a writer. While nothing I write for those sites will ever win a Pulitzer, it’s just the experience of writing on a semi-regular basis that will help me feel more comfortable with writing everyday if and when I end up at a news publication. But what about the content mills’ effects on “real” journalism? Too often, I notice more and more articles from Examiner creeping their way into Google News. I can’t imagine how maddening it might be to a veteran reporter to get scooped by Joe Schmo who didn’t even leave his house to write about whatever has topped the search. Not only is it frustrating to journalists who have been doing this for years, but it’s potentially harmful to the readers. While most of these sites do tend to have strict fact-checking systems in place, not all of them do. Some just check for grammar and plagiarism. So if a story that is factually incorrect somehow gets to the top of Google News, the readers are going to be exposed to misinformation. And because most of the sites do not allow edits to be made to an article once it is published, the information will remain incorrect unless the writer can have it removed from the system. 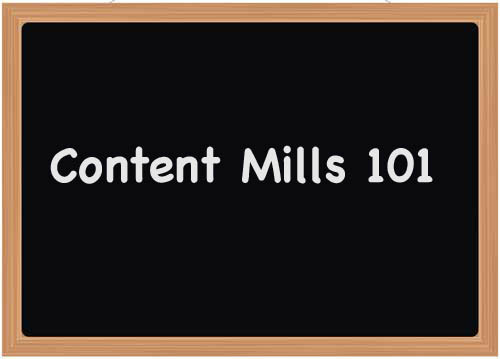 While the main goal of content mills is to provide cheap website content that is easily found using search engines, they are not in the business of journalism, and should never be taken as such. While you may find some writers, like myself, who are journalists and do hold themselves to those standards, not everyone who provides content for these mills is concerned with journalistic integrity. Readers should treat content found on one of these sites much like they would treat a Wikipedia page — as being easy access to information that may or may not be entirely correct. And for the record, I do not include my work for these content mills on my resume. I write under a pen name for most, if not all, the sites I write for. When I was first starting out, before I got to college, I used my real name, and these articles are still visible because I never got around to changing them to my pen name. But I would never use an article that was posted on eHow as a writing sample. If I want to be taken seriously as a journalist, I have to submit serious work as my writing samples. And an article about why video games are better than therapy is not, unless I end up writing for Game Informer, serious work. I don’t know a ton about him, but what you have jibes with what little I know. I do know that he wrote two books (Techno Vision and Techno Vision II) that were published by McGraw-Hill. Other than that, you’ve got a good start!